The following comes from Andy. I join him in inviting you to this very important meeting. Never has there been a time when truth was more important. Deception is rampart in our country so we look to men like Mitchell Shaw to reveal the truth. Be assured he will . Please see the attachment for details. activities of the Society throughout the south eastern states. Mitchell is one of the best informed speakers that I have met in sometime, he has a superior grasp of the political aspects of foreign affairs as well as the total geopolitical situation of the developed world. I found him to be extrodinarilly well informed as well as representing the Society in what I would term a very casual and gentelemanly fashion. I am confident that you will find this speaking engagement an informative and interesting event. 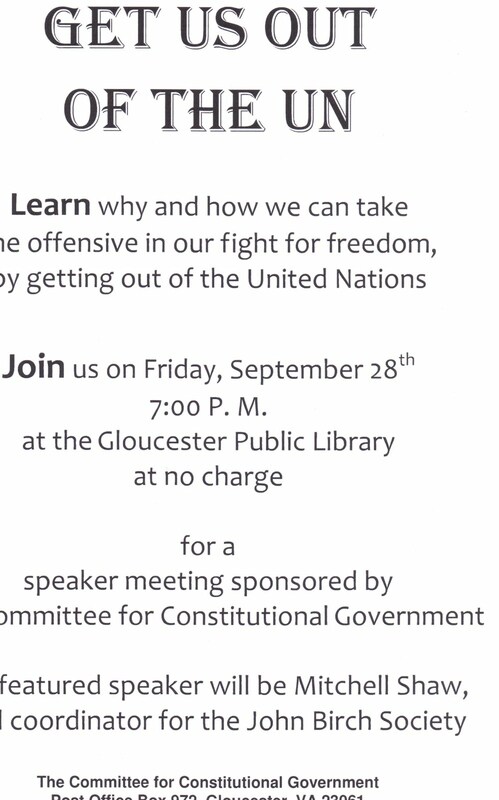 The subject that Mitchell will address is," Get us out of the United Nations." As many of you are aware much of the disruptive and treasonous influences that have come to prevade and undermine Amereica originates from that bastion of evil known as The United Nations. Many of us are certainly familiar with the aspects of sustainable development and its implementation plan, Agenda 21. Recently you may have encountered The United Nations Small Arms Treaty, again its origin is the United Nations. As you may be aware the Law of The Sea Treaty referred to as LOST is again a creation of the United Nations. Contrary to popular perceptions the United Nations is in direct conflict with the United States Constitution and presents a direct threat to the sovereignty of America as a free and independent nation. Many of you may not be aware of the of the outright duplicity of the United Nations in promoting an orginazation whose human rights are not only in contradiction with the original human rights declaration but supports the Cairo Declaration of human rights. The UN has joined with the Organization for Islamic Cooperation, a confederacy of over 50 Islamic Nations that recognizes the Cairo Declaration of Hunam Rights over that of the original UN declaration. As you may know the Cauiro Declaration recognizes Sharia Law for its guidance and implementation, even to non muslim nations. This singular action of the UN is in itself reason to depart from membership in this threatening UN conspiracy that defies our law, lives and liberty, to say nothing of the sovereignty of America. As many of you may be aware, the John Birch Society was organized in 1958 and has held fast to our American Ideals since inception in spite of the best efforts of CPUSA to defame and destroy this stalwart society of patriotic Americans. One could easilly conclude that JBS was the original Tea Party. As many of you may know I am an original member of the Peninsula Patriots. My membership in the Society served me well as a founding member of the Peninsula Patriots. In my humble opinion The John Birch Society has kept the flame of liberty bright through many American Trials, The Society has steadfastly supported the Tea Party since its initial inception. 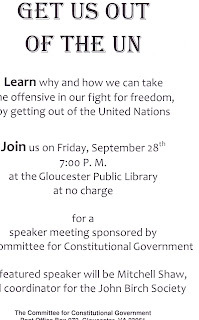 I am asking that all Patriots join in with our local JBS chapter and Give Mitchell Shaw a proper welcome, let there be no doubt in Mitchell's mind that Liberty is alive and well in Mathews and Gloucester counties. Why are there bad politicians? Because God gives us what we deserve. We reap what we sow. Tuesdays Peninsula Meeting at Vancostas.